Domesticating a plant no longer takes a millennium. Years ago, the idea of genetic splicing was a fictional pipe dream that invoked images of bat winged-lions or bears with laser eyes. That’s not on the horizon quite yet, but scientists recently accomplished a feat of genetic manipulation that’s nearly as exciting. They altered the genes of a fruit, the strawberry groundcherry (Physalis pruinose) so that it can be readily cultivated and enjoyed outside of its native region — Mexico as well as Central and South America — for the first time. They published their results Monday in the journal Nature Plants. Groundcherries aren’t unheard of to American consumers, but they’re pretty hard to get. See, the plant is notoriously difficult to keep alive in farms or gardens long enough to get the darn things to blossom in the first place. Like the cherry tomatoes to which they are closely related, groundcherries are particularly vulnerable to destruction by pests and cool temperatures. The researchers used CRISPR-Cas9 gene editing tools to improve the size and rate of flower production for a particular kind of groundcherry called the strawberry groundcherry, known for its tropical vanilla flavor. They’ll use those techniques to help make the plant hardier so it can grow outside its native range. “I firmly believe that with the right approach, the groundcherry could become a major berry crop,” said study author Zachary Lippman in a press release. That’s exciting news, especially compared to what we normally hear from the world of CRISPR research: resilient corn and water-efficient tobacco, for example. These are important but overwhelmingly unsexy developments. But this groundcherry research has a much greater chance of affecting everyday people. Sure, it’s just a berry that grows inside of a weird sack-like husk, but this research shows that we can domesticate a new crop in the lab over just a few years instead of a millennium on farms. If a more resilient, accessible groundcherry suddenly becomes available around the world, people can add a new type of healthy fruit to their diet. This is all possible because scientists had already studied the tomato genome and experimented on it with CRISPR and other techniques. 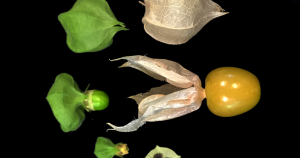 The groundcherry’s genes are similar enough that much of the work came down to fine-tuning existing tricks to a slightly-different genetic code. As such, we may soon see CRISPR-altered versions of other hyper-local plants that have historically been hard to tame in the near future alongside our new supply of groundcherries.